DAGOBA RELEASE FIRST SINGLE, US TOUR WITH DIR EN GREY THIS FALL. "Post Mortem Nihil Est" Due Out Nov 5th! DAGOBA have released a lyric video for their very first single; called "I Empire" from their new record, "Post Mortem Nihil Est" due out Nov 5th, 2013 here in the States. The band also recently confirmed their very first tour on American soil with DIR EN GREY. The artistic output of DAGOBA stands as a testament to the power found within the combination of brutal riffage, mind-bending symphonic atmosphere and dark electro grooves. "Post Mortem Nihil Est" is a shining jewel amidst the dustbin of modern music, offering a furiously creative and persistently dynamic display of nuanced, diverse and challenging material. 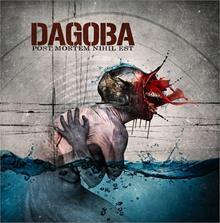 There’s the stomach-punching rawness of true heavy metal and circle-pit inciting bottom end in the Dagoba sound, all of it beautifully balanced by classical elements and the throb and grind of industrial. Dagoba has shared the stage with such genre giants as Metallica, Korn, Sepultura, Machine Head and Fear Factory, while dominating festival bills and club shows internationally. Built upon a foundation of stop-start Pantera type rhythms and Dimmu Borgir style ambience, Dagoba delve deep into the mines of black, death and modern metal and emerge with the most dazzling elements of each subgenre. Fans of Metallica, Morbid Angel and Cradle Of Filth can all connect to the Dagoba sound. It’s a sound that could only have been born and bred in the South of France, with isolation breeding intense creativity and a unique stylistic point of view. The revolutionary spirit of Marseille is infused in Dagoba’s music and attitude. Rock Sound magazine declared: “Dagoba crushes everything and leaves no one alive!” And this was 10 years ago upon the release of the band’s first album!